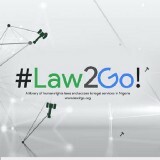 Official Twitter account for a library of human rights laws and access to legal services in Nigeria. Law2go hasn’t been active on Medium yet. Check back later to see their stories, claps, and highlights.